We are back to school and looking for ways to make dinnertime run smoothly. On busy nights I’m a big fan of one pot dinners because they’re easy to prep and easy to clean up. I’ve found kid friendly one pot meals that are both delicious and simple to try this year. 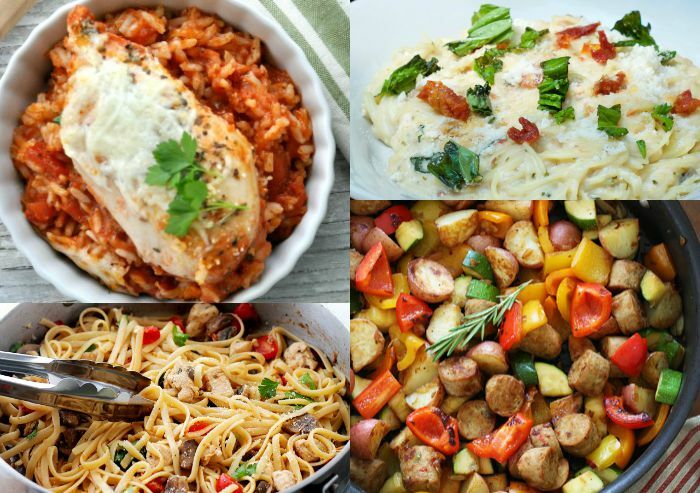 Simple recipes that will please the whole family! Dump and Bake Italian Chicken and Rice by The Seasoned Mom for Coffee Cups and Crayons. This one tastes so delicious you won’t believe the chicken and rice cooked so well in the same pot. Lemon Chicken Fettuccine by Diethood. Light and fresh flavors that will fuel your family up before practice or a big game. Roasted Potatoes with Apples, Sausage and Maple Mustard Glaze by Healthy Seasonal Recipes. Take a break from pasta with this hearty and delicious meal that’s full of flavor. One Pot Cajun Chicken Alfredo by The Chaos and The Clutter. This recipe is light on prep, but big on flavor. Chicken Taco Quinoa Skillet by The Seasoned Mom. Chock full of protein and veggies, this simple dish is super healthy…and kid approved. Creamy Tuna Skillet by Pint Sized Treasures. Tuna and pasta is a money saving main dish that is sure to please. Short Cut Mexican Chicken and Rice Soup by The Seasoned Mom. This recipe is ready in less than 15 minutes and perfect for a school night. 10 Minute One Pot Pasta by Mess for Less. A fresh and easy recipe you can make anytime since it only takes 10 minutes. Stove Top Pastitsio by Lemons for Lulu. Pastitsio is one of my favorite Greek dishes and this simplified stove top version means it can actually be made on a weeknight. Aunt Bee’s Dump and Bake Beef Stew by The Seasoned Mom. 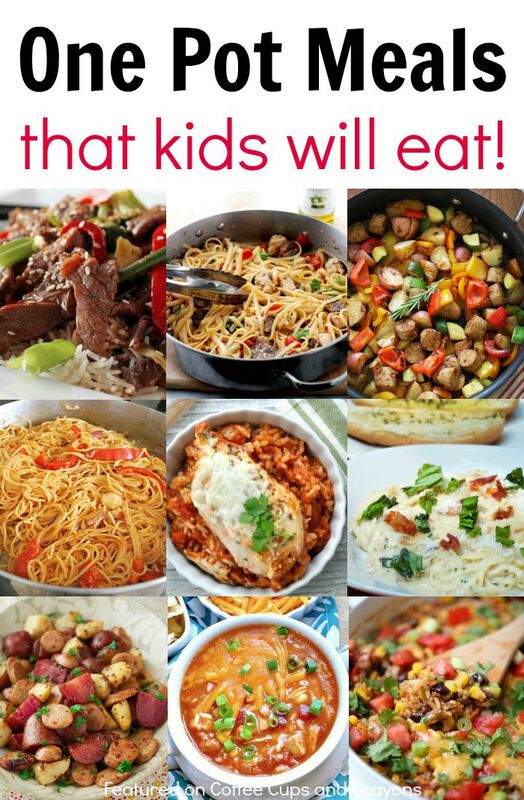 One pot meals are also a great way to get kids to try new foods. They can try a new food mixed in with old favorites. That’s part of the beauty of a one pot meal–easy and yummy! Follow Megan Sheakoski ::Coffee Cups and Crayons’s board It’s Dinner Time on Pinterest. Hi Megan! Just wanted to say thanks very much for including my vegetable beef stir fry in your round up!! Can;t wait to try some of the other recipes – they all look so good! I can’t wait to try YOURS!!!! !